ALL OF THE LIGHTS: Superb artistry and stagecraft make Riley a joy to watch live in concert. 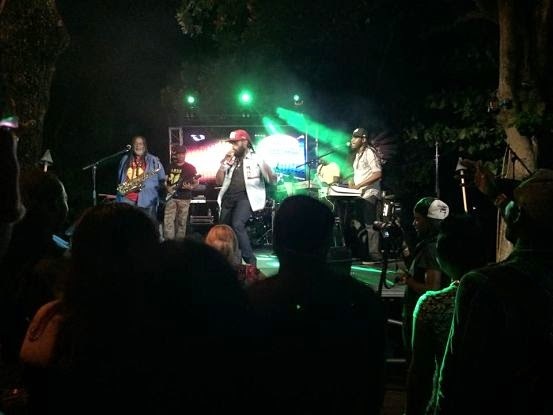 Call Tarrus Riley a megastar in his presence and he quickly sets the record straight. "I'm a super-musician," he tells TALLAWAH. He can say that again. Those who caught his electrifying concert at the Little Theatre on Monday night — the final performance on the Jamaican leg of his Love Situation Tour — would hasten to agree with the entertainer, given the sheer sonic power, charisma, vocal dynamism and the supernova energy of a creature he brought to centrestage, bringing the house to its feet on numerous occasions throughout the night. "Tonight is not a stage show; we are live in concert!" he assured his enthusiastic audience, including those frisky females up front who hung onto his every syllable, musical and otherwise. "And there's no concert without crowd participation." That said, Riley didn't lack for crowd support in delivering the hits with quick succession, segueing from rousing numbers like his cover of "Human Nature", "Love's Contagious" and "Start Anew/Cut It Off" to more grittier tunes like "Lion Paw", "Beware" and "Backbiter." And he was just warming up. Sharply attired in a grey vest, a white long-sleeved shirt, creamy brown pants and his signature black cap, the reggae hitmaker was a musical life force all his own. It helped, too, that the production design (a feat of technical wizardry, gorgeous mood lighting, and crisp, clear sound) was a first-class achievement. You can totally picture overseas venues coming alive under its enchanting spell. No doubt, we were all swayed on Monday night. Whether reasoning with the folks, channelling his inner soul man on John Legend's "All of Me" or captivating hearts with "Stay With You" and "Greatest Creation", the Tarrus Riley fans have come to know and cherish was always present. But he wasn't by his lonesome for the whole night, as he assembled a fine supporting cast (the excellent Black Stars band aside) that raised the stakes. I'm talking about appearances by old-school lyrical kingpins Michigan and Demus and new-generation favourites Iba Mahr, Chevaughn, and Dune Stephenson (a vision in pink!) who each made lingering statements. Dean Fraser, who Riley openly credits with "changing my life" was, as always a savant on the sax. In the end, what left the most memorable impression was unquestionably the effort of the man of the hour (and a half) whose stagecracft and artistry easily draws comparisons to the likes of Damian Marley and Shaggy, and lent the show a powerful ending with the 1-2-3 punch of "She's Royal," the still-hot "Good Girl Gone Bad" and the irresistible new classic "One Drop."